Prime Minister hosts Trump's advisers for a discussion that dealt mainly with the U.S. peace plan. Prime Minister Binyamin Netanyahu met on Friday in Jerusalem for four hours with U.S. President Donald Trump’s Senior Advisor Jared Kushner, Special Representative for International Negotiations Jason Greenblatt and U.S. Ambassador to Israel David Friedman. Israel's Ambassador to the U.S. Ron Dermer also participated in the meeting. Netanyahu expressed his appreciation to President Trump for his support of Israel. “The teams discussed advancing the diplomatic process, developments in the region and the security and humanitarian situations in Gaza,” said a statement from Netanyahu’s office. Arutz Sheva learned that the meeting took place in a very good atmosphere and one of the main issues discussed was the American plan being formulated to renew talks between Israel and the Palestinians, and particularly how to bring the Palestinian Authority (PA) to the negotiating table. Netanyahu heard from his guests that he may have to agree to one significant gesture to the Palestinians if they return to the negotiating table and also agree to an American gesture which some believe will be the opening of an official consulate in eastern Jerusalem. 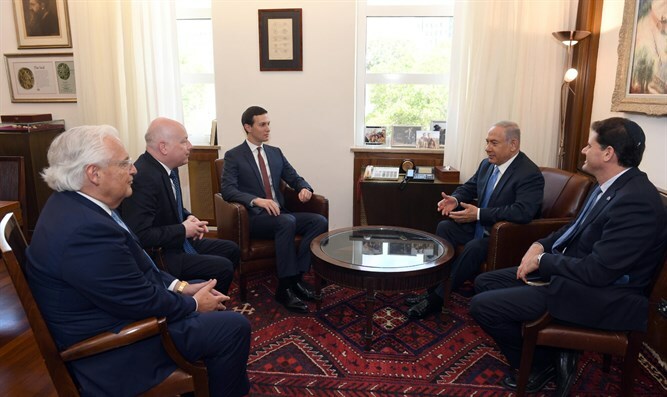 Greenblatt and Kushner are currently visiting the region as the Trump administration prepares to present its peace proposal for Israel and the PA. The two, who have already met Jordan’s King Abdullah II and Saudi Crown Prince Mohammed Bin Salman, will also visit Israel, Egypt and Qatar but are not slated to not visit Ramallah or meet any PA officials.